The next-generation agile multi-cloud platform based on containerization technologies. Choose any public cloud supplier you like (Azure, AWS, Google, OVH, etc.) or opt for a hybrid cloud deployment (Cisco). Then simply define the size of your environment and choose the isolation mode. 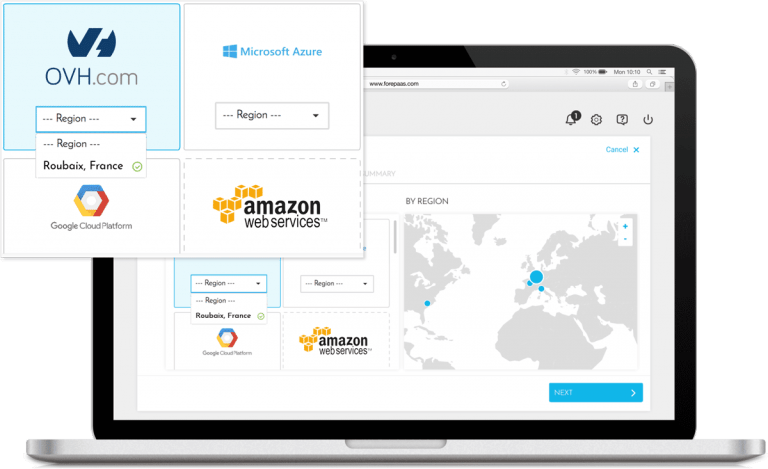 In just a few seconds, the platform will deploy, configure and connect with all the services you need for your project: databases, ETL, load balancer, application firewall, proxy services, applications manager, DNS configuration and user authentication. Hundreds of operations are automated to create your environment simply and quickly. 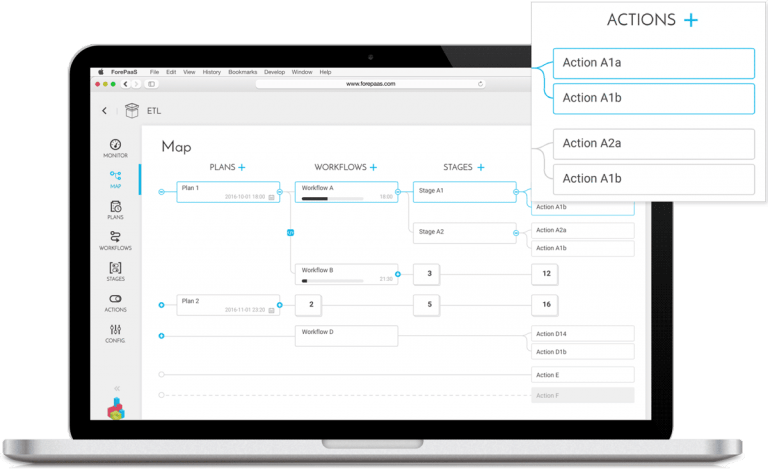 By creating actions for loading, transforming and importing your algorithms, you’ll be able to manage powerful workflows within the ETL module. Import your own libraries to integrate a machine-learning algorithm, for example, or use our Python SDK to fully customize your algorithm. Use connectors or the option to parallelize solution processing and automate your data-quality tasks. Automate your transformations and loading in a fully customizable, scalable environment. First, add your data sources. Those sources may be internal (databases, business systems, big data clusters, flat files, etc. ), external (API, web servers, S3, etc.) or from IoT. 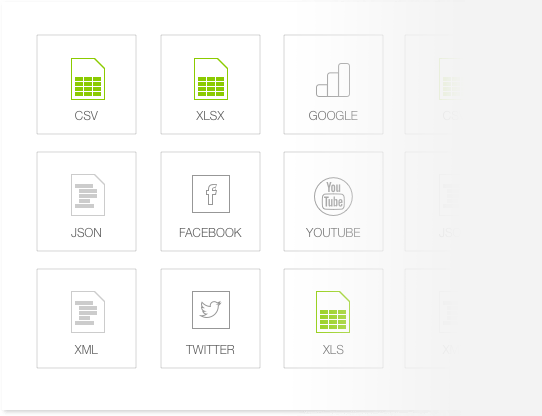 Next, your data is organized in a logical way – without you having to manage any databases. Our data warehouse intelligently optimizes the organization of your data according to its speed, variety and volume – without any need for you to get involved. Then prepare complex queries for your business needs or for application developers. That way, you’ll have a single repository for all your company’s data. Get all the tools you need on a single platform. Deploy APIs to feed your dashboards and your applications developed in ForePaaS or elsewhere. Or communicate in real time with other APIs in response to your data and data science models. 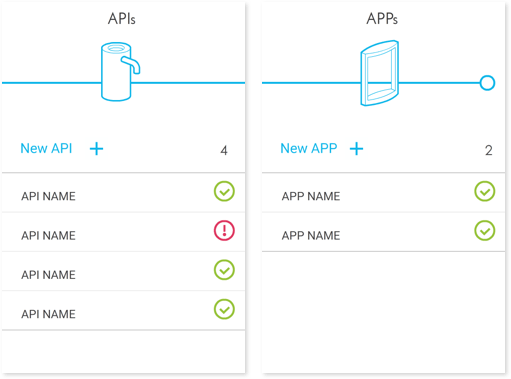 With our SDKs, you can customize your API and your applications without any need for redevelopment: simply use a model in our store and develop your own application using the modules we’ve designed to cover all common development tasks. Then manage the continuous deployment cycle without any need for configuration. 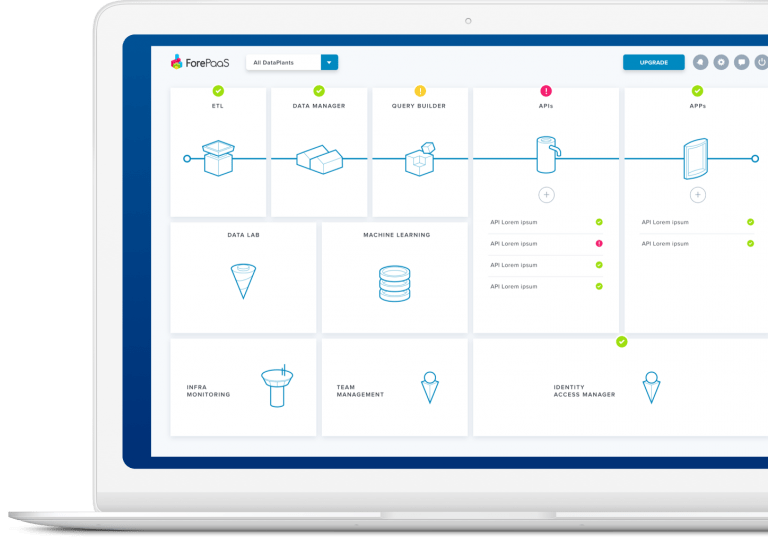 ForePaaS comes with modern development tools and automates every task (blue-green deployment, horizontal scalability in one click, etc.). By offering unlimited customization, ForePaaS brings the agility of the web to the world of data. ForePaaS has been designed to meet all of today’s data mining challenges, whatever the nature or source of the data (big data, IoT, APIs, etc.) and whoever the end user (man or machine). By automating tasks and processes and simplifying technology, ForePaaS enables you to build, deploy and scale data applications & algorithms in record time. ForePaaS is your springboard towards becoming a data-driven company. non velit, Praesent Aenean facilisis ut luctus suscipit ultricies leo.